The Colossus of Constantine (Italian: Statua Colossale di Costantino I) was a huge acrolithic statue of the late Roman emperor Constantine the Great (c. 280–337) that once occupied the west apse of the Basilica of Maxentius near the Forum Romanum in Rome. Portions of the Colossus now reside in the Courtyard of the Palazzo dei Conservatori of the Musei Capitolini, on the Capitoline Hill, above the west end of the Forum. The great head, arms and legs of the Colossus were carved from white marble, while the rest of the body consisted of a brick core and wooden framework, possibly covered with gilded bronze. Judging by the size of the remaining pieces, the seated, enthroned figure would have been about 12 meters (40 feet) high. The head is about 2½ meters high and each foot is over 2 meters long. One of the two right hands of the Colossus. Through this sign of salvation, which is the true symbol of goodness, I rescued your city and freed it from the tyrant's yoke, and through my act of liberation I restored the Senate and People of Rome to their ancient renown and splendor. The great head is carved in a typical, abstract, Constantinian style (“hieratic emperor style”) of late Roman portrait statues, whereas the other body parts are naturalistic, even down to callused toes and bulging forearm veins. The head was perhaps meant to convey the transcendence of the other-worldly nature of the Emperor over the human sphere, notable in its larger-than-life eyes which gaze toward eternity from a rigidly impersonal, frontal face. The treatment of the head shows a synthesis of individualistic portraiture: aquiline nose, deep jaw and prominent chin characteristic of all images of Constantine, with the trends of Late Roman portraiture which focus on symbolism and abstraction, rather than detail. Here was the man at whose court...writers felt it appropriate to speak of the 'Divine Face' and 'Sacred Countenance'. The sculptor has conceived this countenance as a holy mask, an overpowering cult object resembling, though on a far greater scale, the icons of future Byzantium: an idol animated with the divine presence, and with the power to repel the demons lurking in pagan images. The west apse of the Basilica of Maxentius — the original location of the Colossus — is indicated in red. The Basilica, on the northern boundary of the Forum, was begun in 307 by Co-Emperor Maxentius. Constantine completed the Basilica after he defeated Maxentius at the Battle of the Milvian Bridge in 312. Constantine seems to have reorientated the building, changing the site of the principal entrance and adding a new northern apse. With these changes, including the great statue in the west apse, Constantine publicly and visibly declared his overthrow of his vanquished adversary. Precise dating of the statue itself is problematical; it has been suggested that a date of 312–315 for the initial creation of the statue is likely from political considerations, whilst a substantial reworking of the features some time after 325 is indicated on art-historical grounds. The Colossus was pillaged sometime in Late Antiquity, most likely for the bronze body portions. The marble portions of the statue were brought to light in 1486. The surviving remnants were later removed from the Basilica and placed in the nearby Palazzo dei Conservatori Courtyard by Michelangelo, who was working in the area. The fragments are arranged as follows from left to right: the right arm (with elbow), the head, the right kneecap, a right hand, [a columned museum entrance], the left shin, the right foot, the left kneecap, [an ornamented column remnant] and the left foot. Strangely there are two right hands (with upraised index fingers) amongst the remains of the statue, which differ slightly. 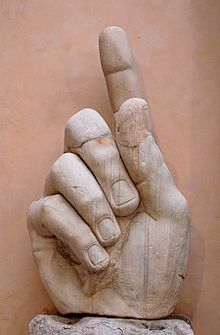 It has been proposed that the statue was re-worked at some time late in Constantine's reign and a hand holding a sceptre was replaced by a hand holding a Christian symbol. The marble fragments underwent restoration during 2000–2001. Between 6 and 10 February 2006, a 3D laser scan of the fragments was carried out on behalf of the Land of Rhineland-Palatinate in collaboration with the Capitoline Museums in Rome. Both reconstruction and castings were displayed from 2 June to 4 November 2007 as part of the major cultural and historical “Constantine the Great” Exhibition in Trier, Germany. ^ Eusebius, Ecclesiae Historia; IX, 9, 11. ^ Grant, Michael (1970), The Roman Forum, London: Weidenfeld & Nicolson; Photos by Werner Forman, p. 161. ^ "The Colossus of Constantine". smARThistory at Khan Academy. Retrieved December 18, 2012. ^ Pohlsander, H. A. (1996), The Emperor Constantine, Routledge, ISBN 0-415-13178-2, p. 34. ^ Pohlsander, Op. cit., pg 80. ^ Grant, Op. cit., pg 194. ^ Pohlsander, Op. cit., pg 79–80. Wikimedia Commons has media related to Colossus of Constantine. This page was last edited on 14 April 2019, at 18:12 (UTC).